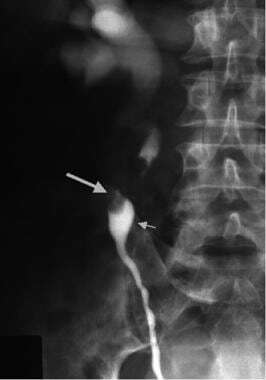 Right retrograde pyelogram demonstrates large filling defect in midureter due to transitional cell carcinoma (large arrow). Note characteristic appearance of radiographic contrast material just distal to obstruction (small arrow), which gives rise to so-called goblet sign. Contrast is also visible beyond partially obstructed segment of ureter in renal pelvis and collecting system. See Renal Cell Carcinoma: Recognition and Follow-up, a Critical Images slideshow, to help evaluate renal masses and determine when and what type of follow-up is necessary. Surgical intervention is the main form of radical treatment for localized disease. Medical therapy usually is administered as an adjuvant to surgical therapy or to patients in whom surgical treatment is contraindicated (eg, because of poor general condition or the presence of advanced disease). The role of radiation therapy in the management of upper urinary tract TCC is not well defined. For patient education resources, see the Cancer Center, as well as Blood in the Urine. TCC accounts for more than 90% of renal pelvic tumors; other cancer types seen include squamous cell carcinoma (SCC) and adenocarcinoma. The predominant histologic pattern of UC is a papillary tumor with stratified, nonkeratinizing epithelium supported on a thin fibrovascular core. TCC of the upper urinary tract is histologically identical to urinary bladder cancer. These 2 malignancies share the same risk factors and can occur as a part of “field cancerization,” which results from exposure of urothelium to carcinogens excreted or activated in the urine. Hence, upper urinary tract urothelial tumors may be multifocal, and in 2-10% of cases, they are bilateral as well. Patients with upper urinary tract urothelial tumors are at risk for the development of bladder tumors, which have an estimated incidence of 20-48%. Bladder cancer usually appears within 5 years. Patients with primary bladder cancer develop upper urinary tract UC in 2-4% of cases. The frequency of upper urinary tract UC may reach 21% in patients with bladder carcinoma in situ (CIS) and in those with certain occupational exposures. The exact cause of upper urinary tract TCC is not known; however, several risk factors have been identified. Workers in the chemical, petrochemical, aniline dye, and plastics industries, as well as those exposed to coal, coke, tar, and asphalt, are at increased risk for renal pelvis and ureteral tumors. Cigarette smoking appears to be the most significant acquired risk factor for upper urinary tract UC. It is suggested that 70% of upper urinary tract urothelial tumors in men and 40% of those in women can be attributed to smoking. Chronic bacterial infection with urinary calculus and obstruction may predispose to the development of urothelial cancer. SCC is the most common entity in these cases. Schistosomiasis also may predispose to SCC. The chemotherapy drugs cyclophosphamide and ifosfamide are implicated in the development of urothelial cancers in the upper and lower urinary tract, particularly after drug-induced hemorrhagic cystitis. According to American Cancer Society, an estimated 79,030 bladder cancers and 63,990 kidney cancers will be diagnosed in the United States in 2017. Primary ureteric and other urinary organ malignancies, on the other hand, are much less common; it is estimated that 3630 such cancers will be diagnosed and 920 patients will die of this disease in 2017. Deaths from urothelial malignancies have been decreasing since 1995. Worldwide statistics vary and are inaccurate, in that renal pelvis tumors are not reported separately. The highest incidence is found in Balkan countries (eg, Bosnia, Bulgaria, Croatia, Romania, and Serbia), where UCs account for 40% of all renal cancers and are bilateral in 10% of cases. Renal pelvis tumors rarely occur before age 40 years. The peak incidence is in the 60- to 70-year age group. Men are affected approximately 2 times as frequently as women are. The incidence is slightly higher in African Americans than in other races; reported rates are similar among white Americans, Hispanics, and Native Americans. Renal pelvic tumors are less common in Asian Americans. Tumor stage is the most important prognostic factor for upper urinary tract UC. Survival correlates closely with tumor stage. The TNM staging system developed by the International Union Against cancer (UICC) for upper urinary tract carcinomas is the most comprehensive (see Staging). Tumor grade is another predictor of prognosis (see Histologic Findings). Tumor grade usually follows tumor stage, and patients with high-grade carcinomas have more advanced (ie, high-stage) disease. Stage and grade correlate in as many as 83% of cases, though stage remains a more accurate predictor of prognosis. Patients with stage T3 renal tumors have a better prognosis than those with ureteral tumors. A retrospective study by Park et al found that in patients with stage pT3 disease, 5-year cancer-specific survival rates were 77.5% for renal pelvic tumors invading the renal parenchyma versus 49.7% for tumors invading peripelvic or periureteral fat; 5-year recurrence-free survival rates for the 2 tumor types were 75.6% and 32.0%, respectively. The authors suggested that the thickness of the renal parenchyma may protect against local tumor spread. The 5-year survival rate in selected patients after conservative surgery is reported to be 70-90%. Recurrences in the remaining urothelium after conservative treatment are relatively frequent because of the multifocal nature of TCCs. Ipsilateral recurrence rates may reach 25-50%. Most low-grade recurrences can be treated with repeat conservative excision. The 5-year survival rates in these patients with low-grade, low-stage disease can approach 100%. The prognosis is poor for patients with advanced SCC. Siegel RL, Miller KD, Jemal A. Cancer statistics, 2016. CA Cancer J Clin. 2016 Jan-Feb. 66 (1):7-30. [Medline]. [Full Text]. De Broe ME. Chinese herbs nephropathy and Balkan endemic nephropathy: toward a single entity, aristolochic acid nephropathy. Kidney Int. 2012 Mar. 81 (6):513-5. [Medline]. Grollman AP, Shibutani S, Moriya M, et al. Aristolochic acid and the etiology of endemic (Balkan) nephropathy. Proc Natl Acad Sci U S A. 2007 Jul 17. 104(29):12129-34. [Medline]. Colin P, Koenig P, Ouzzane A, et al. Environmental factors involved in carcinogenesis of urothelial cell carcinomas of the upper urinary tract. BJU Int. 2009 Nov. 104(10):1436-40. [Medline]. American Cancer Society. Cancer Facts & Figures 2017. Available at http://www.cancer.org/acs/groups/content/@editorial/documents/document/acspc-048738.pdf. Accessed: January 5, 2017. Margulis V, Shariat SF, Matin SF, et al. Outcomes of radical nephroureterectomy: a series from the Upper Tract Urothelial Carcinoma Collaboration. Cancer. 2009 Mar 15. 115(6):1224-33. [Medline]. Park J, Ha SH, Min GE, et al. The protective role of renal parenchyma as a barrier to local tumor spread of upper tract transitional cell carcinoma and its impact on patient survival. J Urol. 2009 Sep. 182(3):894-9. [Medline]. Novara G, De Marco V, Dalpiaz O, et al. Independent predictors of contralateral metachronous upper urinary tract transitional cell carcinoma after nephroureterectomy: multi-institutional dataset from three European centers. Int J Urol. 2009 Feb. 16(2):187-91. [Medline]. Necchi A, Sonpavde G, Lo Vullo S, Giardiello D, Bamias A, et al. Nomogram-based Prediction of Overall Survival in Patients with Metastatic Urothelial Carcinoma Receiving First-line Platinum-based Chemotherapy: Retrospective International Study of Invasive/Advanced Cancer of the Urothelium (RISC). Eur Urol. 2017 Feb. 71 (2):281-289. [Medline]. Sonpavde G, Pond GR, Fougeray R, Choueiri TK, Qu AQ, et al. Time from prior chemotherapy enhances prognostic risk grouping in the second-line setting of advanced urothelial carcinoma: a retrospective analysis of pooled, prospective phase 2 trials. Eur Urol. 2013 Apr. 63 (4):717-23. [Medline]. [Full Text]. Sonpavde G, Pond GR, Rosenberg JE, Bajorin DF, Choueiri TK, Necchi A, et al. Improved 5-Factor Prognostic Classification of Patients Receiving Salvage Systemic Therapy for Advanced Urothelial Carcinoma. J Urol. 2016 Feb. 195 (2):277-82. [Medline]. Todenhofer T, Hennenlotter J, Esser M, et al. Combined application of cytology and molecular urine markers to improve the detection of urothelial carcinoma. Cancer Cytopathol. 2012 Nov 21. [Medline]. Vikram R, Sandler CM, Ng CS. Imaging and staging of transitional cell carcinoma: part 2, upper urinary tract. AJR Am J Roentgenol. 2009 Jun. 192(6):1488-93. [Medline]. Jeong YB, Kim HJ. Is It Transitional Cell Carcinoma or Renal Cell Carcinoma on Computed Tomography Image?. Urology. 2011 Dec 21. [Medline]. Rastinehad AR, Ost MC, Vanderbrink BA, et al. A 20-year experience with percutaneous resection of upper tract transitional carcinoma: is there an oncologic benefit with adjuvant bacillus Calmette Guerin therapy?. Urology. 2009 Jan. 73(1):27-31. [Medline]. Demery ME, Thezenas S, Pouessel D, Culine S. Systemic chemotherapy in patients with advanced transitional cell carcinoma of the urothelium and impaired renal function. Anticancer Drugs. 2012 Feb. 23(2):143-8. [Medline]. Tully CM, Apolo AB, Zabor EC, Regazzi AM, Ostrovnaya I, Furberg HF, et al. The high incidence of vascular thromboembolic events in patients with metastatic or unresectable urothelial cancer treated with platinum chemotherapy agents. Cancer. 2016 Mar 1. 122 (5):712-21. [Medline]. Giannatempo P, Pond GR, Sonpavde G, Raggi D, Naik G, Galsky MD, et al. The Impact of Adding Taxanes to Gemcitabine and Platinum Chemotherapy for the First-Line Therapy of Advanced or Metastatic Urothelial Cancer: A Systematic Review and Meta-analysis. Eur Urol. 2016 Apr. 69 (4):624-33. [Medline]. Di Lorenzo G, Buonerba C, Bellelli T, Romano C, Montanaro V, Ferro M, et al. Third-Line Chemotherapy for Metastatic Urothelial Cancer: A Retrospective Observational Study. Medicine (Baltimore). 2015 Dec. 94 (51):e2297. [Medline]. [Full Text]. Balar AV, Galsky MD, Rosenberg JE, Powles T, Petrylak DP, et al. Atezolizumab as first-line treatment in cisplatin-ineligible patients with locally advanced and metastatic urothelial carcinoma: a single-arm, multicentre, phase 2 trial. Lancet. 2016 Dec 7. [Medline]. Zibelman M, Ramamurthy C, Plimack ER. Emerging role of immunotherapy in urothelial carcinoma-Advanced disease. Urol Oncol. 2016 Dec. 34 (12):538-547. [Medline]. Pak RW, Moskowitz EJ, Bagley DH. What is the cost of maintaining a kidney in upper-tract transitional-cell carcinoma? An objective analysis of cost and survival. J Endourol. 2009 Mar. 23(3):341-6. [Medline]. Straub J, Strittmatter F, Karl A, Stief CG, Tritschler S. Ureterorenoscopic biopsy and urinary cytology according to the 2004 WHO classification underestimate tumor grading in upper urinary tract urothelial carcinoma. Urol Oncol. 2012 Jan 31. [Medline]. Hsueh TY, Huang YH, Chiu AW, et al. A comparison of the clinical outcome between open and hand-assisted laparoscopic nephroureterectomy for upper urinary tract transitional cell carcinoma. BJU Int. 2004 Oct. 94(6):798-801. Kawauchi A, Fujito A, Ukimura O, et al. Hand assisted retroperitoneoscopic nephroureterectomy: comparison with the open procedure. J Urol. 2003 Mar. 169(3):890-4; discussion 894. [Medline]. Ong AM, Bhayani SB, Pavlovich CP. Trocar site recurrence after laparoscopic nephroureterectomy. J Urol. 2003 Oct. 170(4 Pt 1):1301. [Medline]. Rosenberg JE, Hoffman-Censits J, Powles T, et al. Atezolizumab in patients with locally advanced and metastatic urothelial carcinoma who have progressed following treatment with platinum-based chemotherapy: a single-arm, multicentre, phase 2 trial. Lancet. 2016 May 7. 387 (10031):1909-20. [Medline]. Sharma P, Retz M, Siefker-Radtke A, et al. Nivolumab in metastatic urothelial carcinoma after platinum therapy (CheckMate 275): a multicentre, single-arm, phase 2 trial. Lancet Oncol. 2017 Jan 25. [Medline]. CT scan with contrast, vascular phase. Mass can be seen in left renal pelvis (black arrows). Patient underwent nephroureterectomy. Tumor was high-grade urothelial carcinoma invading subepithelial tissue (stage T1) and measuring 7.5 × 3.2 × 3 cm. CT scan, delayed phase. Enhancing mass can be visualized in left renal pelvis (white arrows). Retrograde pyelography. Filling defect can be seen in left renal pelvis and lower calyx (black arrows). Patient underwent left nephroureterectomy. Tumor was low-grade urothelial carcinoma measuring 2.5 × 2 × 1 cm. Pathology specimen shows urothelial tumor of renal pelvis (white arrows). Disclosure: Serve(d) as a director, officer, partner, employee, advisor, consultant or trustee for: Pfizer, Exelixis, Eisai, Novartis, Merck, Argos<br/>Received research grant from: Pfizer, Bayer.